SBI (State Bank of India ) account holders are getting SMS and emails from bank regarding linking of their Aadhar numbers with their SBI bank accounts before December 31, 2017. You have online and offline options for linking your Aadhar number with SBI account. Offline Method - Visit Your Branch : Pay a visit to nearest SBI office with Aadhar card and a copy of it and submit a request. 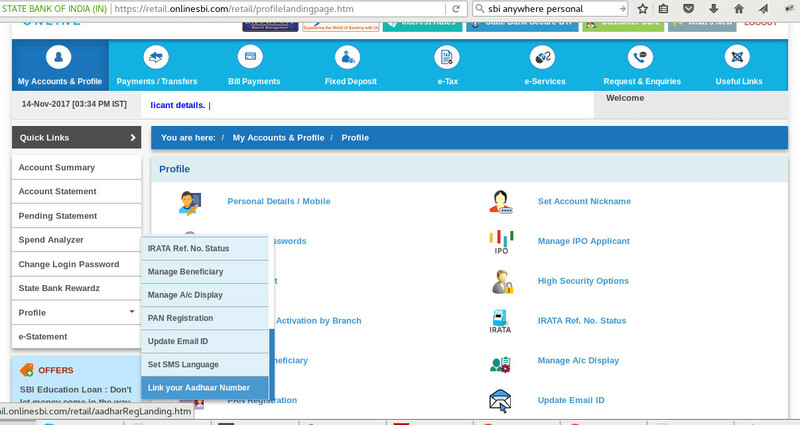 Online Method - Through SBI web portal : Use the online linking option in your SBI customer web portal. Online Method - Through SBI mobile application: Use the online linking option in your SBI Web app (SBI anywhere Personal) . Place mouse over "Profile" menu tab and select "Link Your Aadhar number" option. You will be asked to enter your profile password, enter it. On next page, enter your Account Number, 12 digit Aadhar number and confirm it. An SMS with OTP will be send to your registered mobile phone. Enter the OTP to complete the verification process. Now you have initiated the process of linking your Aadhaar card Number with your SBI bank account. You will receive the status of linking with in few hours. 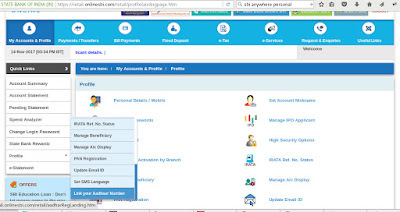 If you have installed "SBI anywhere Personal" in your mobile, do the following steps. Else you can download and install the SBI mobile banking app from google Play store.